In this Jan. 31, 2018, file photo, Simone Biles talks with Megyn Kelly. 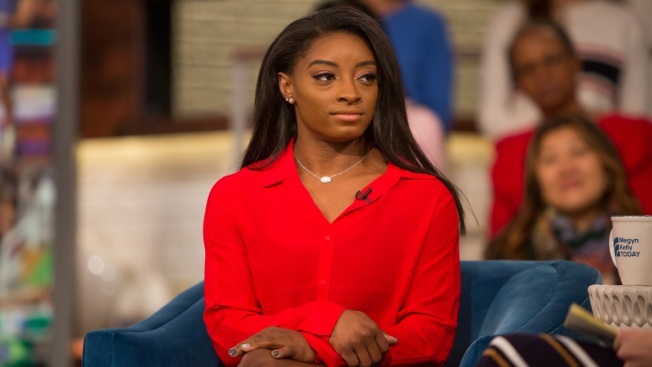 Olympic gold medal gymnast Simone Biles is opening up about how she initially coped with being sexually abused by former team doctor Larry Nassar, saying she tried to sleep off what had happened. During a discussion for the new YouTube series, "If I Could Tell You Just One Thing," hosted by Priyanka Chopra, Biles revealed she first opened up to a friend about the abuse. "I called her and I asked her the definition of 'sexually abused,' because some of my other friends, they had had it worse than me,'" she recalled. But Biles, 22, said she decided against saying anything publicly and instead "brushed it off" because she didn’t want people to see her differently. "I’m not willing to put that out there for the world to see," she said. "They’re not going to see me as Simone the gymnast, they’re going to see Simone the sexual abuse survivor." But her experience led to depression and constantly sleeping. "I told one of my lawyers, I said, ‘I sleep all the time because it’s the closest thing to death,'" recalled Biles, who said she remains in therapy. The way Biles responded to the trauma is not unusual, according to health experts familiar with so-called "depression naps" that allow people to escape stress and anxiety through sleep. According to Harvard Medical School, a variety of studies indicate that between 65 to 90 percent of adult patients with major depression experience some type of sleep problem. In January 2018, Nassar, a doctor for USA Gymnastics and Michigan State University, was sentenced to 40 to 175 years in prison after admitting to sexually abusing girls and women for decades. Among the hundreds of other athletes who came forward to accuse Nassar of abuse were fellow Olympic gymnasts including Aly Raisman and McKayla Maroney.